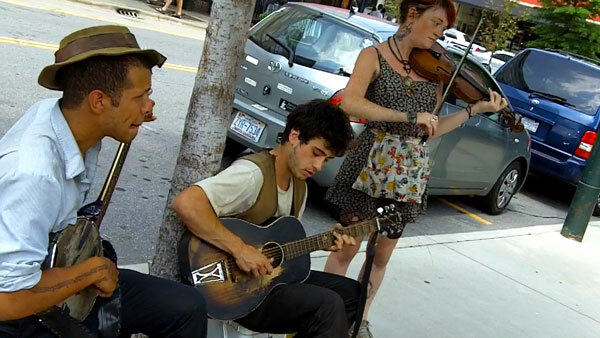 Way back in May of 2011, Busk Break caught a few songs from New Orleans-based buskers Natchez On Fire during their brief visit to Asheville. One of those songs, their version of the classic “Crawdad Song,” was released at the time, but this song never made it out of the archive. Now, for the first time ever, we present Natchez On Fire’s “The Yo-Yo Song”! Natchez On Fire broke up the following year, so this is one of the few recordings of the band playing outside of their hometown. Members from the band, however, appear in several other Busk Break videos with other projects. Like many of our early videos, the video suffers a little from trying to use an action-following flow rather than something more sensible, like a tripod. There’s a kind of rough-weather sailing feel to this period in Busk Break, but at least the audio turned out fairly good. The filming would improve later, but these were early days, and it shows. The second video from the session is a little more focused and watchable. Keep an eye out for it soon.